Shirley Downey is an amazing lady. Her passion for Childhood Literacy led to the development of the Born to Read New Brunswick program. Shirley brought the idea of a bag of books for each child born in New Brunswick to her IODE Heritage Chapter in St. Stephen,New Brunswick. From there it was adopted by Provincial IODE and has expanded to the excellent program it is today while keeping IODE New Brunswick in their program to this day. Shirley is an inspiration to all New Brunswick chapters to improve the education of children in New Brunswick. Shirley Downey, began a program to provide a bag of books for each new-born baby. It was such a good idea it spread across the province. 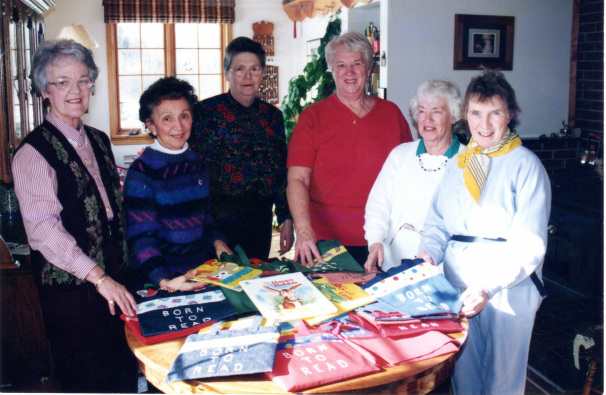 The picture is of a group of Fredericton area women with their f﻿reshly﻿ made Born to Read bags. Under Shirley's leadership it became a program supported by the IODE, the Provincial Government and partners from the business community. Now every baby born in New Brunswick receives a bag. One of these bags has been sent to His Royal Highness Prince George. "Born to Read, patterned after a program in Quebec, was started in St. Stephen, New Brunswick in 1991 by Heritage Chapter IODE and soon became a provincial IODE project. In 1997 the Lieutenant Governor of the province Marilyn Trenholme Counsell, backed the program and gave her pension to buy books for the bag. Her vision was for this program to reach every baby born in the province. As a result, Literacy NB Inc. provided administrative and fundraising support to gather partners to achieve province wide distribution. Francophone organizations designed the program in French, known as Le goût de lire. This vision became a reality." Visit Born to Read New Brunswick for more information.